Bags for Art :: All Custom Framing Always 40-50% Off for Portland OR and Vancouver WA - Custom Picture Framing, Picture Frames, Framing and Art Framing and Supplies. 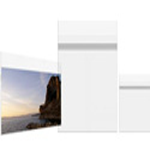 A revolutionary product to display your artwork while beautifully displaying and safely protecting. Protective Closure Crystal Clear Bags are ideal of photography and art. The Protective Closure feature ensures the adhesive will not come in contact with the contents when re-using the bag. Made from Biaxially Oriented Polypropylene (BOPP), a superior material that does not easily rip, tear, wrinkle, or fog like other plastics. Acid and lignin free, archive quality, USPS approved.